I grow bonsai. As such, I need a place to store some of my trees during the Winter. 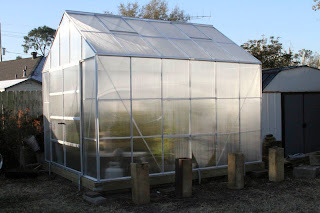 After Katrina ate my Quonset-style greenhouse, I have been looking for a sturdy and nice looking greenhouse. Do not buy this one. 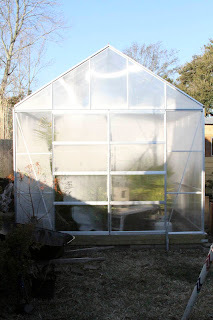 I bought the greenhouse pictured from Harbor Freight Tools. Regularly $799, the kit was on sale for $599 with a coupon. To beat the coupon end date, I bought the kit on December 1, 2009. It waited until the 28th for me to assemble it over Christmas break. The assembly instructions are sorely lacking in many details. At some points, the instructions are wrong; at others, there are gaps. The top beam of the doorway consists of 4 pieces of aluminum. Following the guide, I constructed the beam both left/right and front/back incorrectly. Calling the number on the instructions, I was redirected to another number. They sent me a dozen or so JPG files via email which saved the construction process. Even so, I had to do some divination between what the instructions were telling me and what I had available. In retrospect, I followed the instructions correctly. Everything fits if you already know where it is supposed to go. I made one significant modification to the instructions. I bolted the base to the ground instead of burying the base in the ground. The base is made of steel. In New Orleans, you do NOT bury steel in the ground. It will rust out in less than a year. Instead, I leveled the ground with gravel and bricks. The base sits on the bricks. On the outside of the base, I assembled a square of treated lumber. That is fastened together using deck hardware. The steel base and boards were then bolted to fence posts which had been driven two-feet into the ground. During the wind and storm, that base did not move. This greenhouse is listed at 158-pounds. Less than an average man. Given that it is 10x12x10 (LxWxH), a strong wind would have torn it's 4-inch base out of the ground and sent the entire structure sailing over my fence into my neighbor's house. Thus, my modification of the base is a better plan than as instructed. With the use of a propane heater, all of my plants survived. The temperature in the greenhouse never went below 38° even when the temperature outside dropped to 24° (according to my digital Hi/Low thermometer). The tropical plants that I missed storing were all killed by the frost. Thus, the greenhouse did what it was designed to do. That's the only positive thing I can say about the greenhouse. Come late January, the New Orleans area was hit with a change of weather that brought with it winds in the 45mph+ range. The greenhouse lost both front doors and several panels. I found one in my neighbors yard after scouring the neighborhood. I lost a few of the clips that hold the panels in place, but the kit came with extras, so I was good for now. Between then and now, the greenhouse had suffered several smaller wind storms. While I did not lose anymore panels, the doors had come off again. Then came March 1, 2010. Another change of weather and another strong night of winds. By the time I came home from work at 6pm, one of the doors had already come off along with two of the panels. One was in the neighbor's yard. The winds were such that moving the fallen door into the greenhouse took a great deal of effort and courage. I was scared to be in the structure. At 7:30pm, I heard a crash. I turned on the lights and saw that the structure had collapsed into a tangled mess of panels, metal, and trees. The winds had died down to a moderate 20mph range by 10pm. I checked on the greenhouse to see if I could salvage any of my trees. They were overturned, but no pots or branches had been broken. I contacted the number on the assembly book and told my story to the operator. He put me on hold and told me he would get the correct number to which he would transfer my call. And he hung up on me. I called again and while I swear he was the same person with an Indian accent, he gave a different name. This time when he put me on apologetic hold, he didn't hang up. He got me the number to the Corporate Office saying that the hours were 8-5 Eastern time. Nope. That's Western time. I called the number and was told to call back when Customer Service was open. It's in California. When I called Customer Service, the woman who took my information was quite snippy. Whenever I say my city name, I always offer to spell it. It has a French origin. "I KNOW how to spell your city name, sir," she said with venom in her voice. I was thinking "Well, excuse me. I was being nice. Who crapped in your Cheerios, lady?" It was the first time I've ever had someone take insult to my offer to spell my city's name. AND SHE WORKS FOR CUSTOMER SERVICE! Unfortunately, she doesn't work for the CORRECT customer service. "Sir. We just cover the Catalog and Web Site sales. You'll need to contact the manager at the store where you bought the greenhouse." Apparently, a greenhouse that cannot stand for more than 2 months without turning into a mass of sharp broken metal isn't of concern to the company which sells it nationwide. She told me that she did not know the wind rating on the greenhouse. I told her that I did not know it either since it was not in the assembly instructions, on the box, on their web site, or in their paper circular. Whatever it is, it has to be below 45mph winds. That's what bruised it in January and killed it in March. Anyone know the number to the correct Federal agency I should contact regarding unsafe consumer products? The people at the local Harbor Freight Tools were much more receptive to my complaint. I told the store manager that the corporate office said he should know what to do with my information. "I'm glad they say that I should know what to do with this," he said with a smile. He took the photos I printed and made a copy of my original sales receipt. He then took my name address and phone number and said that someone will be contacting me soon. This is what happened. It's all true. This is my review of the product and the process. Your experience may be different. The aerodynamics of your site may allow this greenhouse to sit pretty for years to come. Mine lasted from December 29 to March 1. I still enjoy shopping at Harbor Freight Tools. I'm looking forward to buying more tools from their store. Nice people (except for one snippy Californian). I just want the world to know that I give this greenhouse my rating of "Do Not Buy". Unless you can guarantee that it will not be hit with winds greater than 25mph, you'll need to think long and hard about this purchase. For a point of reference, my pre-Katrina Quonset-style greenhouse was made of wood frames in the front and back with 3/4-inch PVC irrigation pipes making up the spine. I cover it with shade cloth and clear 6-mil visqueen. 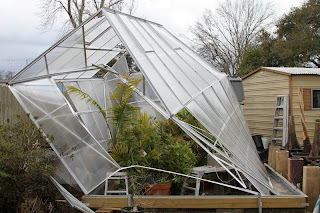 During strong storms the greenhouse flexes in the strongest gusts and returns to its original shape. I'll be building another one in late September (ahead of the November chill). I'll post the building progress at that time. In the mean time, I'm going to sit back and wait to hear what the store has to say about my experience. Tuesday, the day after the storm, I got the latest mailer from Harbor Freight Tools. My wife jokes, "See if they have another greenhouse for you." I unfolded the ad and there it was on the front page. $200 off the regular price with the coupon. Same photo. Same product code. $600 (plus tax) is a hard price to pay for something that works, but does not last. Thank you very much for your review. I saw the 6x8 One Stop Gardens greenhouse in my local Harbor Freight circular. It had a $140 off Super Coupon for a $249.99 sale price. Chicago is not known as the Windy City for no reason. As much as a want a greenhouse, I will not be purchasing this one. I hope that you will be able to get a refund from Harbor Freight Tools. Have yourself a Safe and Great day! I also bought this greenhouse. You were lucky yours got blown over. Mine is still standing and I've spent countless hours fighting with bent frame pieces, panels falling off, door not opening, etc. If it hadn't taken so long to put together, I'd have taken it to the dump already. It is two years old. I am in eastern Ne near Lincoln and also bought the 10x12 greenhouse from Harbor Freight. I saw the obvious need for a beefed up foundation so sandwiched the steel beams that came with the unit between two treated 2x6's and bolted through the three pieces and buried it up to the sill plate. It gave some added weight to the base as well. I have it sheltered from the wind on three sides so no problem there. It has survived some 70mph winds up to this point but when I see a storm coming I close it up tight. It is on it's second summer here now and there are hundreds of holes melted through each roof panel. Apparently there is no UV coating on the panels as advertised. I have not yet been back to Harbor Freight to tell them about it but will soon. I too highly recommend against purchasing this piece of Chinese made crap. 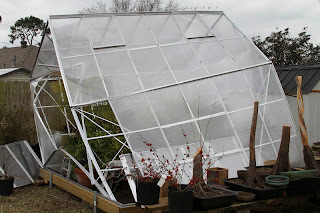 I would not expect a $600 greenhouse to last against 45mph winds. This is not a surprise to me or anyone who looks at this greenhouse for more than 10 minutes. There is a reason a 10x12 greenhouse from a garden supply house costs around $3000. With that said, I would think about $50 worth of 2x4's and 1x2 lumber as an inner support frame and panel frame hold downs would of easily saved your greenhouse. I doubt the $3000 unit would of held up much better in a 45mph wind. I have had good luck with my 6 x 8 version of the Harbor Freight unit. I laid concrete blocks on the ground, and treated 2 x 4 boards on top of the boards. I bolted the green house frame to he wood base using 2 screws at each panel base. Probably over kill but it is tight and should not move a bit during winds. I used more clips than shown on the instructions and foam rope where the panels seemed loose. My main problem has been the door installation. I can't get it to stay on the bottom track. Any suggestions please ? I bought the same green house on August 2011. It still standing, but I've had to replace many of the panels. Every time a storm of 25+ blows by, we loose at least one panel. Home Depot has better quality panels, but at a cost of $35 each. I've already had to purchase 9. Good thing is, when a new storm blows by, the Home Depot panels stay in place. Many times we can reattach the original panels, but other times the panels are bent out of shape or cracked because of its poor quality. I've run out of replacement fastener and had to screw in place many pieces and/or glue them down with caulking. The top door frame broke in half right down the middle. Before that, the doors kept coming out of place. DO NOT PURCHASE! I have been struggling for a year whether or not to buy it. Houston is too windy. Thanks! I live in Missouri, We have had our 10x12 Greenhouse for 5 or 6 years now. We did use several reinforcement methods as it is rather flimsy, but with a few corrective products like Galvanized Conduit to reinforce the structure and needing to oil the seals on and around the door to keep from freezing together have had pretty good luck with it. The Greenhouse does have some protection as it is about 4 foot from the house. Had one panel that consistently blew out, until we reinforced it and attached it permanently. "Galvanized Conduit to reinforce the structure " That's a really good idea too. I've just been playing with the 1" diameter galvanized conduit from home depot ($6 for a 10 foot section) very economical and significantly smaller than the 2x4's I was using. I didn't even buy the bending tool. I bend them right in the store. Do you still have your greenhouse? I still have mine. Did not have any issues with panels blowing out this year with the high winds since the Mr fixed that one panel. It is very dry in there this summer so been using it to dry herbs. yeah, my greenhouse becomes a walk in minature haunted village for halloween the potting shelves lined with jack-o-lanterns. I appreciate the testimonies here, but they wouldn't qualify for poster children for the genius club. I live in Florida so I know about wind. Big wind. I bought a 6x8 at an estate sale yesterday. I figure my $200 is a pretty safe bet. People who whine about their new cars not starting because they can't find their keys are the same geniuses that complain about a product that any man with a Man Card can pickup. Given the surface area of any given side, this is a grown up box kite that these same geniuses will stick out in the open and bolt down with 2x4's (wtf!). Now study that last paragraph, please. One bump of the shoulder against the frame should confirm we have a delicate structure, one NOT designed for wind. No problem. I plan to guy wire and anchor the corners to immobile concrete bases. The racked and now useless structures shown here were NOT properly anchored for wind. And don't whine about the instructions. They can't figure for every non-engineer out there. Most, if not all, bad storms here in Florida occur in the summertime--when we don't need protection from the occasional frost. Now those that read ahead will have already figured the answer: remove some of the panels to equalize the air pressure. Duh! Air flow during this more humid time is also healthier for the plants. Please, please use your God given heads. And thank you in advance. I like the article and the comments. One thing that I see people not thinking about is wind load. Most of the "reputable" greenhouses sell 8x8 or 6x8 rather then 10x12. 10x12 is 120 sqft of surface area, 8x8 is 64 (1/2 the 10x12) and 6x8 is only 48, almost 1/3 of the 10x12. So to expect a 10x12 of any manufacturer to hold up to significant wind is the issue. Don't get me wrong, I've read lots of issues with panels flying away but the structure itself is going to have to be shielded from winds with that kind of flat surface area exposed. Imagine trying to stand up to even a 10 mph wind holding a 10'x12' piece of panel and you see why this could be an issue. But I completely agree that this is not for someone just wanting to put it up as shipped. I also was looking at just building one but the corrugated tufftex panels alone, without even adding in wood and hardware was $824 for a 10x12 structure so modifying this one is going to be cheaper for me than building from scratch. There are endless vids on YouTube on how to strengthen these at a very nominal cost . Just takes some 1/2" metal conduit a drill and some screws- people that did that seem to be satisfied. You spend $600 and some hardware and time . Or you spend $3000 and they do the design . Your choice. Money or time its what you got the most of solves your problem.